While at the Cosmo Beauty Expo I was introduced to the brand D’Ran Skincare Solutions. I sat down with their team and learned about their product lines, ingredients, and the R&D centers in Korea that make it all possible. It was a great chance to find a new high quality skincare line that actually works. Plus, they are also cruelty-free and ensure no animal testing during any of their manufacturing processes! They sent me home with some products to try, and I have to say I’m in love with them. My first post was all about the Wonder Tea Tree Series so be sure to check it out if you love to use tea tree to heal blemishes and keep your skin clear and fresh. The other 2 products I received were from different series including the Oh Beau series, and their Snail Treatment series. Here is some information on each. TL;DR: Wow! I’m impressed. This series includes a lotion, toner, serum, cream, and eye cream. I was intrigued by this line because it boasts revitalizing skin cells through fermented ingredients, as well as snail secretion. The formulas help with anti-aging, as well as improving wrinkles and moisture retention of the skin. I received the Concentrated Recovery Serum. First, the gold packaging is beautiful and the pump dispenses the product well. It has a nice formula and texture and absorbs well when applied on the face. The smell is light and diffuses after application. I haven’t experienced any breakouts (due in part to the combo use with the Tea Tree essence) and really like how my skin is feeling these days. The ingredient lineup is wonderful! No junk preservatives or fillers like mineral oil or parabens. I’m always looking for products that have unique ingredients. This line boasts fermented soybean extracts that helps improve wrinkles. It also contains 7 other fruits and grains that help improve elasticity and strengthen the skin wall, protecting it from external pollutants. This product also contains snail filtrate which I love and will talk more about in another product I tried below. I apply this at night before my the Wonder Snail cream and wake up feeling moisturized and visibly radiant. My husband has even noticed with how vibrant my skin looks these days. I am looking forward to trying the whole product lineup and see how they work together. You can read more about the products here on their website, and I’ll link purchasing details below. I fell in love with this product at first try. Snail secretion has been a huge trending ingredient in Korea and I’ve been excited to try a quality product that focuses on this ingredient. This cream claims to restore skin’s youth and radiance in just 7 days through its active ingredients including 10% snail secretion, niacinamide to balance dark spots and scars, and aloe. I saw that claim firsthand. My skin looks great after using this product consistently as a part of my skincare routine. Snail mucin also helps regenerate damaged skin and scar tissue so I would recommend trying this as a way to help heal and improve the look of acne scars over time. Read more about the benefits of this product here. Whether I use this cream after the serum, or on its own, my skins looks great. My skin feels nice and moisturized throughout the day and I’ve noticed less dry patches on my forehead. I suffer from dry skin all year long so it’s great to find a product that is actually helping with that. It isn’t heavy though, and I can still apply my primer and makeup, and not feel my face is heavy or sticky. 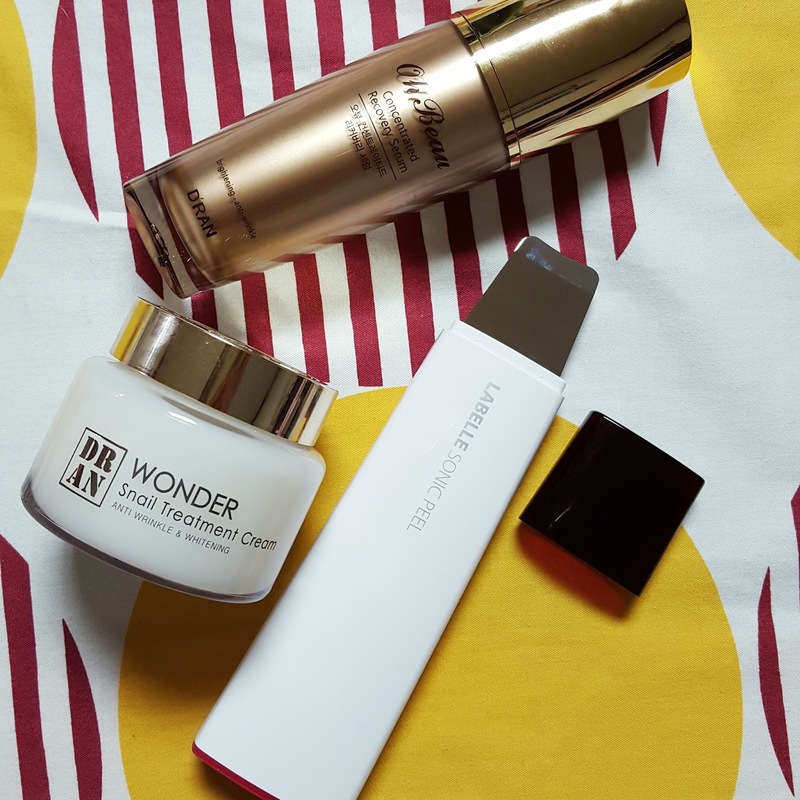 I’ve been using these products in the evening, in addition to my new sonic skin peeler (peeling once a week) and I am so pleased with the results. I’m excited to share with my readers a new Korean skincare line that uses powerful active ingredients in their products, and that is also guaranteed cruelty free! D’Ran Cosmetics are available for purchase online as well at their counters. Here are their Seoul locations (plus, they are in the Incheon Duty Free shops! Score!) Check Meme Box USA, too, for a few of their products.